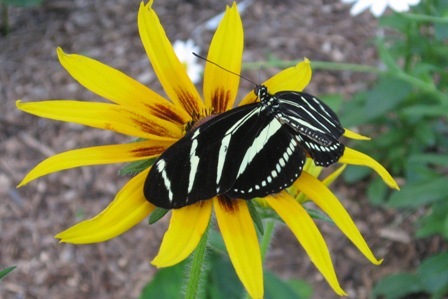 The Butterfly House at the San Marcos Nature Center is Open to the Public! The Butterfly House is located behind the Nature Center, in the gardens. Tours are available based on staff availability, or you can call ahead to schedule a tour at 393-8448. Entry to the exhibit is free, although they greatly appreciate donations to help us keep the Butterfly House running and full of butterflies. They currently have zebra longwings, monarchs, painted ladies, giant swallowtails, question marks, blue wing, rusty tipped page, banded orange, banded peacok, julia, and queen butterflies. It is really an amazing experience to see these species close up in one location!